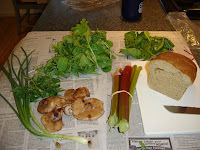 Week 5 of the CSA brought us a loaf of organic whole wheat bread, eggs, green onions, spinach, salad greens, oregano, rhubarb, and shiitake mushrooms. Yum!! SP & I immediately made use of some spinach and green onions for dinner. I suggested we use the eggs and bread to make French Toast later this week for dinner -- SP's brother later IM-ed SP that the bread was too good to eat as French Toast!!! So we'll see - but I have been craving French Toast lately. And we have leftover bacon from dinner last night (we used half a package in the pasta dish and cannot re-freeze the remaining half package).